The 7-2 Monetary Policy Committee split vote today to keep policy on hold meant we didn’t quite see a third rate hike dissenter. However, the statement’s explicit reference to most MPC officials seeing a withdrawal of stimulus as 'appropriate over the coming months' was probably as effective a signal the Bank could have sent to engineer a slightly steeper UK rate curve – while retaining the legitimacy of the MPC process. We are inclined to see the primary intent of today’s hawkish signal as an attempt to realign market expectations with the idea of a gradual BoE tightening path, rather than preparing markets for an imminent rate rise. The latter, as the policy statement caveats, remains a function of how the UK economy evolves over the coming months; the added layer of heightened UK political uncertainty – stemming from crucial Brexit-related events in the next few months – means that a November rate hike shouldn’t be viewed as a sure fire bet. Indeed, we’d like to think underlying the BoE’s message today was the subtle tactic of ‘extremeness aversion’ – offering an extreme option (in this case potential near-term rate hikes) to anchor markets more towards the middle ground (slightly higher rates at some point over the next few years). The debate over the timing of the first Bank rate hike – and what looks at this stage weighing up November versus February – may just be short-term noise in the overall extent to which BoE policy can influence GBP price action. 'Withdrawal of stimulus' which should be interpreted as a 'one or two and done' type of hiking cycle. 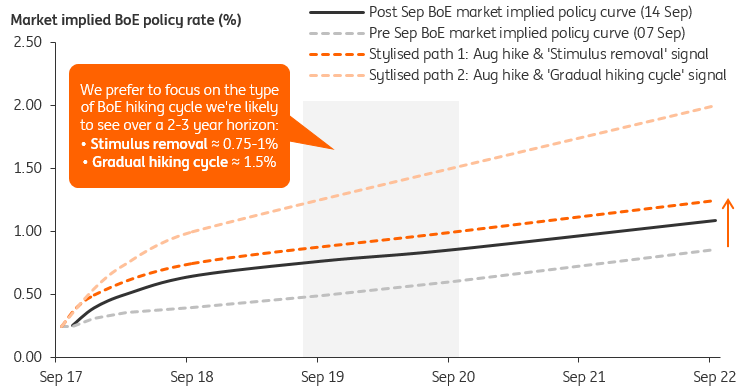 'Gradual and limited' hiking cycle which may indicate a more open-ended BoE normalisation path that would result in a much steeper market curve than the above alternative. While the BoE statement contained both signals, the emphasis on a 'withdrawal of stimulus' means we expect any future BoE policy normalisation to be more in line with the idea of a 'one or two and done' type of hiking cycle – as opposed to a Fed-like policy tightening cycle. As the chart below shows, the shift higher in the UK rate curve following today’s hawkish BoE tone means we’re not too far off the extent to which we expect short-term rates to move up towards in our 'withdrawal of stimulus' hiking cycle scenario. 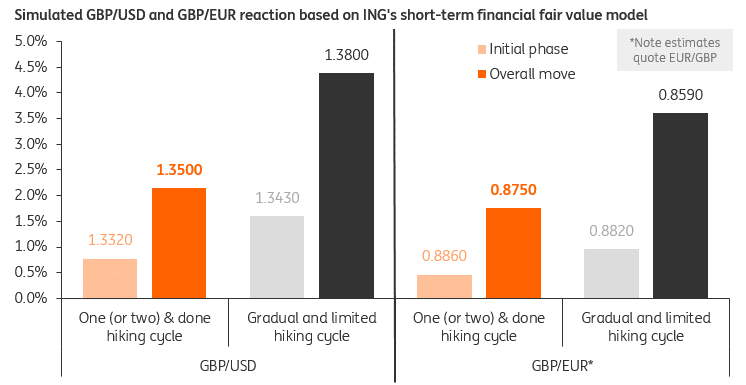 Over the coming weeks, we expect greater BoE forward guidance in line with our 'stimulus removal' hiking cycle scenario to cap the extent to which GBP can move higher. A further 25-30bp move higher in short-term UK rates will, at best, offer GBP a one-time boost. Our model-based simulations show GBP/USD could move up to 1.35-1.36 but would likely face strong resistance here. For EUR/GBP, we think the move lower could extend to the 0.8750-0.8800 area if the BoE-fuelled GBP rally continues. However, the above estimates are based on an isolated move in short-term UK rates - and makes the conservative assumption that US and Eurozone rates remain constant at current levels. Moreover, we would expect Brexit to once again recapture the narrative for GBP price action in October ahead of key political events, and this could well limit the extent to which Sterling moves materially higher in the near-term. Nonetheless, the sustained move in EUR/GBP below 0.90 following today's BoE meeting has almost certainly shelved any ‘parity’ fears for now. We look for the pair to consolidate in the 0.8800-0.9000 region over the coming weeks, with downside risks should UK political risks fade, and bullish EUR sentiment recede further. A move higher in GBP/USD may be harder to come by were the dollar to find support from higher US rates; our view for a slightly more dovish Fed next week means GBP/USD could extend its near-term move higher towards 1.3500. We remain content with our forecast for EUR/GBP at 0.90 and GBP/USD at 1.33 by the end of 2017, though see greater risks of pencilling in additional GBP strength if we see steps towards a Brexit transitional deal over the coming months.